This easy crock pot recipe, is not only delicious, but can be prepped and cooking in as little as 15 minutes! 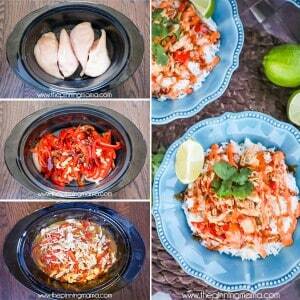 The Asian flavors cook together to make a dinner my whole family devours fast! 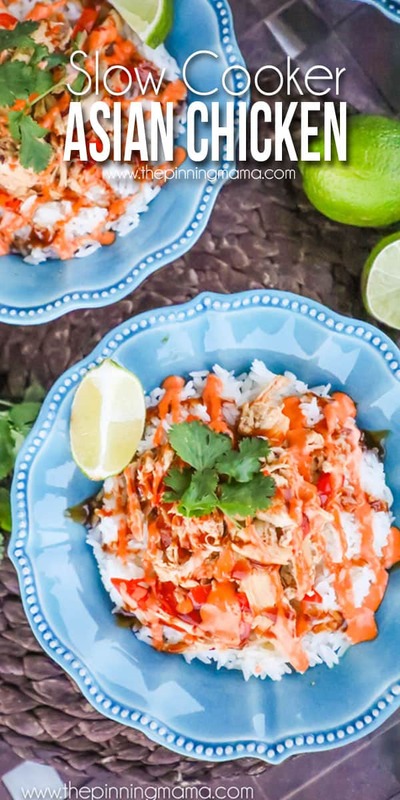 Serve the Asian Chicken over rice and top it with teriyaki sauce and spicy mayo and it will rival your favorite take out! I didn’t grow up with a very adventurous palate, but after I went to college, I learned the joy of delicious Asian food. It all started with Chinese take out, then when my husband and I visited Korea I had some of the best Thai food and instantly fell in love with that. Then last year we went to an event with a ton of local Utah food trucks. Each one looked so good, and I really think I might could have eaten it all. There was wood fired pizza, corn dogs, a taco truck, and even a bacon on everything place. This one truck though was serving Korean BBQ. After having visited Korea, I was not at all temped by the Korean BBQ, so I would have walked right on without a second thought, but the line was like insane! What did all of these people know that I did not? WHY DID THEY ALL WANT KOREAN BBQ? Because it is crazy delicious, that’s why! I couldn’t resist finding out what all the hype was about so I joined the line (that wrapped around the building) and when I finally got to the front I scanned the 5 item menu which was basically Beef, chicken, pork, tofu or a combination of those on rice, noodles, and a little lettuce, then topped with a two crazy delicious sauces. One is a soy sauce based glaze, and the other is a spicy sauce you can order by heat level. I got the Kko-kko bop which is the chicken bowl and it was love at first bite! It is tangy, sweet, and spicy and all around delicious. If you find yourself making your way through Utah, make sure to make a stop by one of their trucks or physical locations, but if not, I created my own little version to make at home. 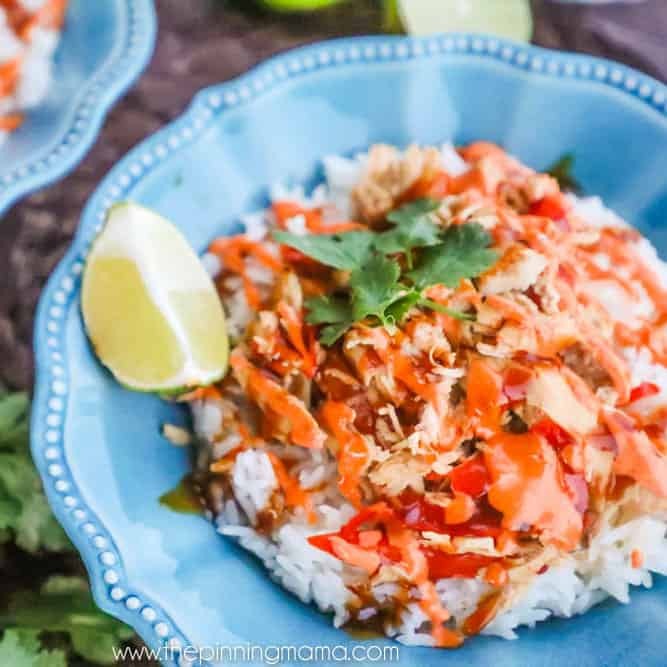 This is not an exact copycat by any means, but it is delicious and just as important, super easy to make for a busy weeknight since you throw it all in a slow cooker and let it do it’s thing. And in my humble opinion, it really hits the spot when you want those delicious Asian take out flavors and just don’t have the time to get out. Trim the chicken and lay it in the crock pot.I spend a lot of time in the kitchen and have had my knife set since we got married 11 years ago. Over the holidays,WÜSTHOF sent me a new knife set and guys… seriously, I did not realize how much I was missing out in life. Cutting with sharp knives is LIFE CHANGING! It took me about half the time and effort to get a whole family pack of chicken trimmed and prepped because there was no fighting. The blades just slid through the meat with almost no effort! It even made cutting butternut squash (for another recipe) seem easy! I have been looking for new knives for awhile and went to an event at the Culinary Center here in Salt Lake a while back where a knife expert recommended I get a 4″ and 8″WÜSTHOF chef knife and said that would do 80% of everything I needed in the kitchen. I lucked out into a whole set, and feel like I should have replaced my knives YEARS ago! If you spend any amount of time in the kitchen, seriously, look into them! Slice the red pepper into strips removing seeds, stem, and ribs. Pile the sliced pepper on top of the chicken.The Cupbop bowls didn’t have red peppers in them. I think they may have had sweet potato noodles, and a little lettuce, but otherwise, not many veggies. I always try to slip a few more in to up the nutrients and lower the overall calories of a serving and thought that red peppers would work well with the flavors. I loved the end result so they are definitely a keeper in this recipe! Top the peppers with the teriyaki sauce, vinegar, garlic, and red pepper, cover, and turn the crock pot on low for 6 hours, or high for 3-4 hours.The red pepper adds to the flavor of this dish but isn’t really enough to make it spicy on it’s own. If you are super sensitive to spice you can omit this, but my kids gobbled the meal up without a word of it being spicy so I feel pretty confident that this is still very mild even with the addition of the pepper. 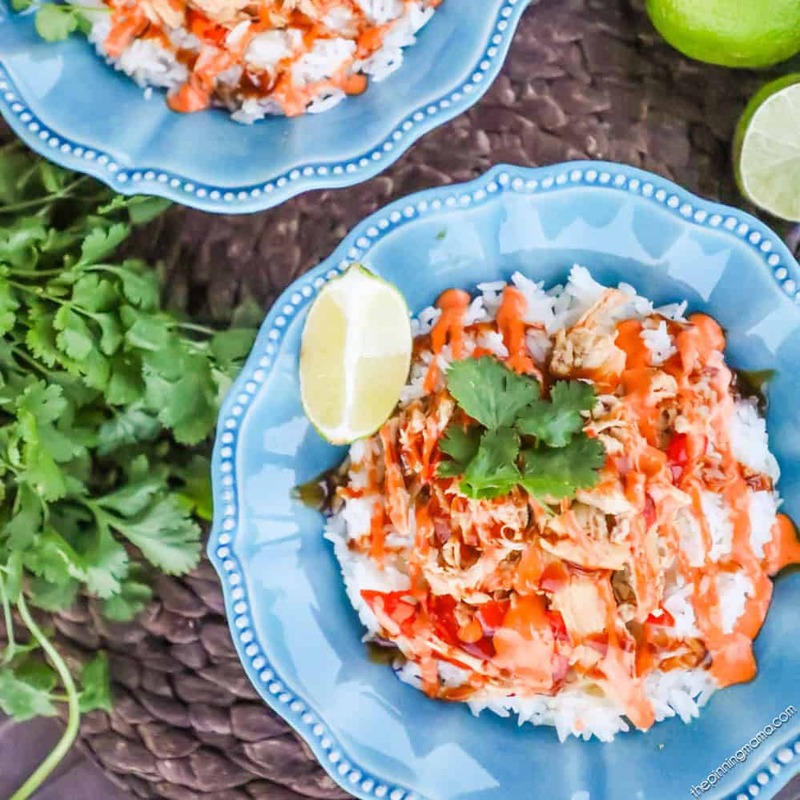 The spicy mayo layered on top of the chicken when it is served is what gives the dish a kick, so if you are looking for spicy, never fear, you can add as much heat as you want! If you don’t want it spicy then you can eat it with toned down spicy mayo or none at all for a nice mild Asian inspired dish. 30 minutes before the end of the cook time, remove the chicken and shred it. Then return the chicken to the crock pot and stir to coat in the juices and let it cook the remaining 30 minutes. 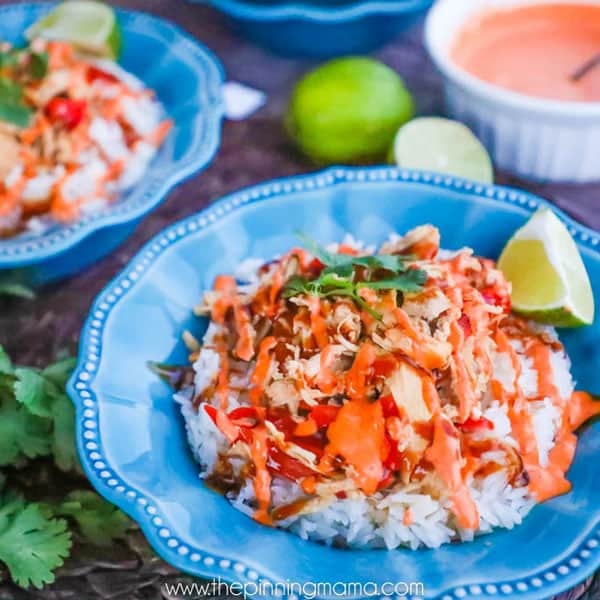 To serve, place a scoop of jasmine rice in a bowl, top with a chicken, then drizzle with teriyaki glaze and spicy mayo. Garnish with chopped cilantro if desired.I used about 1/2 – 1 Tbsp of each topping on top of each bowl, but you can adjust to taste. 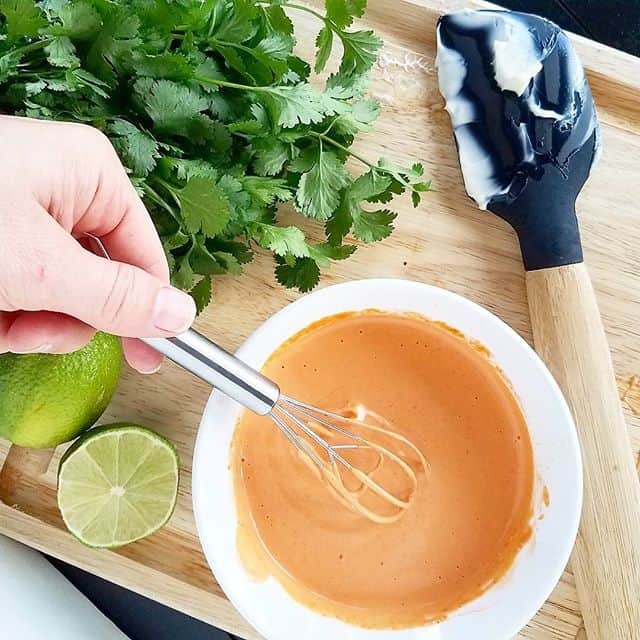 I used the teriyaki glaze right from the jar, then quickly whipped up a batch of this 3 ingredient spicy mayo. You can scale the mayo to your taste for more or less spice to customize your bowl the way you love it! The best part of these are that the leftovers are just as good, if not better. So package it up for a quick and easy lunch the next day too! If you have a soft spot for Asian take out like me, I hope that this recipe will really hit the spot for you. We are mildly obsessed to say the least ha! If you make this recipe, I would love to hear about it in the comments. It always makes my day when people love the recipe as much as I do! Or.. tag me on Instagram @easyfamilyrecipes and show me your creation! Trim the chicken breasts and place them in the slow cooker. Slice the red peppers into thin slices, discarding seeds, stem and ribs, then place the peppers on top of the chicken in the slow cooker. Top the peppers with the teriyaki glaze, vinegar, garlic and pepper flakes, then cover and cook on low for 6-8 hours or high 3-4 hours. 30 minutes before they are done, remove the chicken, shred it, then return to the crock pot and mix to combine with the sauce. Let it cook the remaining time or until done. To serve place a scoop of rice in a bowl. Top with chicken mixture, then finish with teriyaki glaze and spicy mayo. Garnish with fresh chopped cilantro if desired.